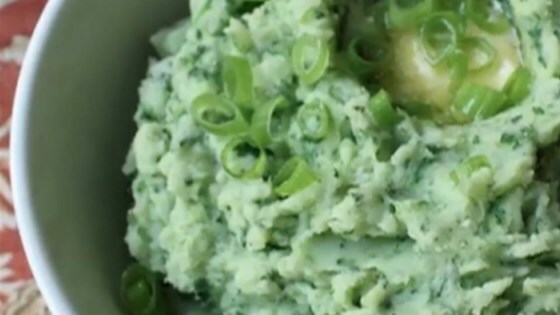 "Colcannon is probably my favorite St. Patrick's Day recipe. It combines the lovely, spring-is-finally-here-greenness of kale and leeks with the always alluring comfort of buttery mashed potatoes." Boil potatoes in a large pot of salted water until tender, about 10 minutes. Drain and transfer potatoes to a large bowl. Add 2 tablespoons butter and lightly mash the potatoes. Boil kale and leeks in a large pot of water until tender, 5 to 7 minutes. Drain and transfer kale and leeks to a blender. Add white parts of the green onions and 2 more tablespoons butter; blend until smooth, scraping down sides as needed, 1 to 3 minutes. Stir pureed kale mixture into the bowl of potatoes and continue to mash. Season with salt and black pepper to taste. Add cream and stir until desired texture. Top with 2 tablespoons butter and green parts of the green onions. Healthy hash for holiday brunch! You can substitute kale with other leafy greens such as Swiss chard or cabbage. Made this as recipe states. Was really Tasty. But abit of a hot mess serving it thank god was for my kids and not for guests. I recently discovered chef johns recipes and I love them! Followed to a T and Chef John, yet again, does not disappoint! Yum! This was wicked good! We did it with Kale as called for and it was really delicious. Had it with pork chops in pork gravy and warm brown bread. It'll be on our Easter menu with Ham.